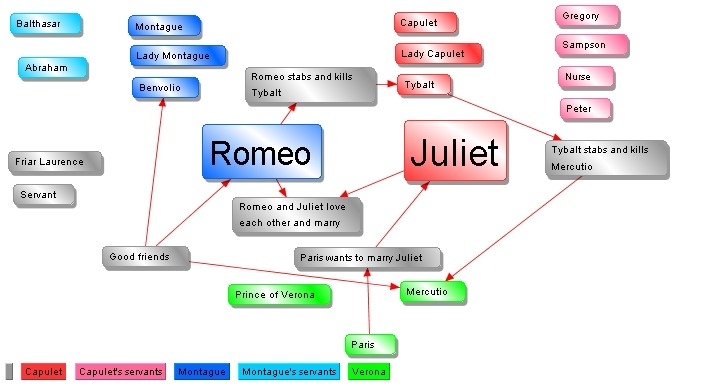 The following diagram gives a student an overview of Shakespeare's "Romeo and Juliet". The characters are listed in the left-most column, and the precis of events starting at the top of the second column with act 1 so that students who think and memorise visually can work with the play more easily than if they are only dealing with the text. Using such visualisations makes it is easier to notice and remember facts which might otherwise have been overlooked. 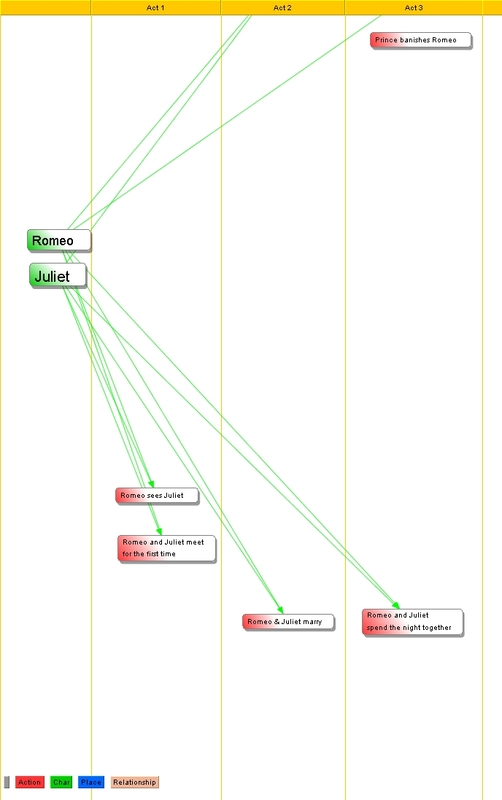 For instance: the CapuleTs have names which end in "t" (e.g. "JulieT"), whereas the MontagUEs' names end with a vowel (e.g. RomeO). So a school-child who noticed this would have a better understanding of the play, being more easily able to sort the characters into their families so he or she could more readily move on to the deeper and more challenging aspects of the play. Characters have relationships with one another. Students who have the task of producing a "sociogramm" like this have to analyse the play in some detail, thereby improving their understanding. 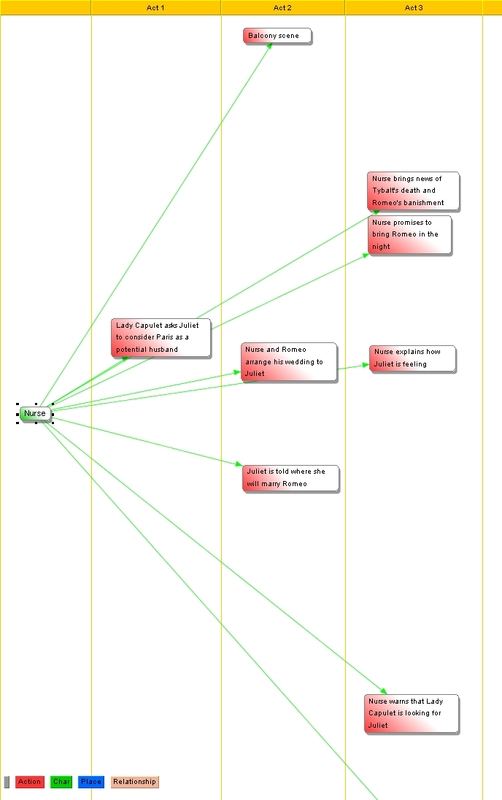 If you are preparing a production of the play, it might be a good idea to get each actor to work out his relationship to each of the other characters in a diagramm like this. Another aid for the actors or in generally understanding the play is to see when certain characters are on stage together. 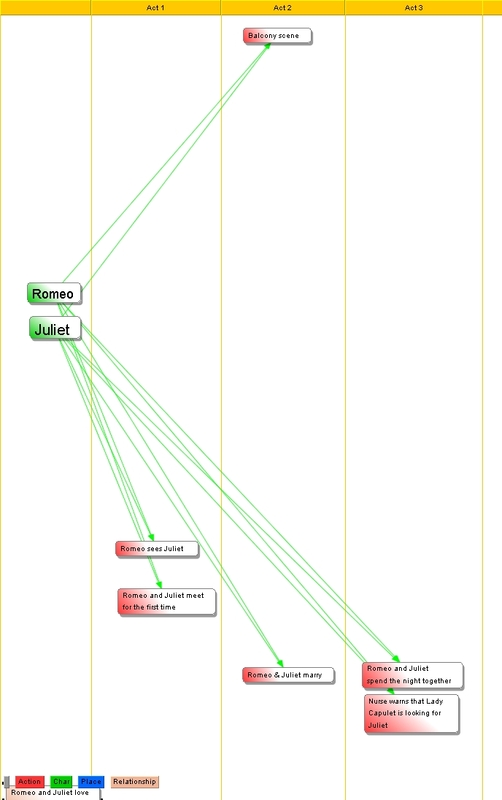 Here we see how surprisingly seldom Romeo and Juliet appear together (in the first three acts). This is basically the same as the first diagramm on this page, but with most of the information hidden so we can concentrate on the information we require. A student who read the play and created such a diagram would quickly learn the play's structure because he or she would be working with the information, rather than just passively reading it. In the case of "Romeo and Juliet" this is not an end in itself, of course. It allows the student to learn the basics more easily and then move on to a deeper understanding of the work. Buying a licence removes the limitations of the demo version so you can correct and complete the project. If you correct or complete this file, we would be very happy to publish it here. Also, if you input other plays or totally different subjects into i2Brain, we would love to share them with other visitors to this site.